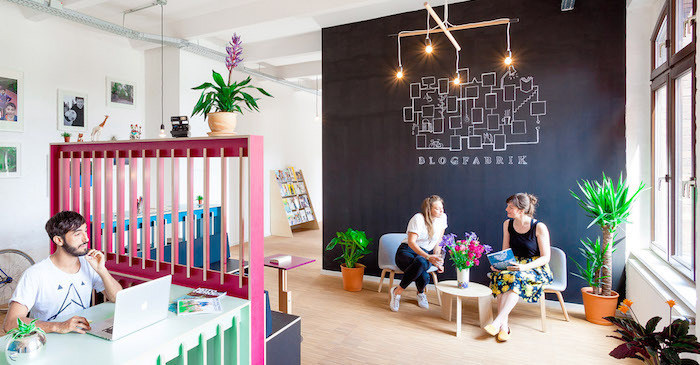 You may have already heard about Blogfabrik, the Berlin-based coworking space that gives you a desk in exchange for your writing skills. The innovative concept behind this German coworking space has already garnered significant media attention, in addition to inspiring new ways of imagining coworking spaces, as not just based on traditional fees, but as service based platforms fueled by creative exchanges. Recently celebrating it’s one year anniversary, we caught up with Blogfabrik’s lead project manager, Maria Ebbinghaus, to find out what it takes to build a community of trust and collaboration. Fortunately, we are part of the powerful Melo Group, a Munich- based group specializing in media distribution, which both invested and supported us. They strongly believe in the future of digital publishing, so we are encouraged to experiment and try out different things. As a result, our creative agency has a very strong collaborative aspect. For different types of projects, we are able to combine various skill-sets and talents ultimately offering very creative solutions when it comes to content marketing. What do you think that coworking could do for industries that focus heavily on social media and digital media? 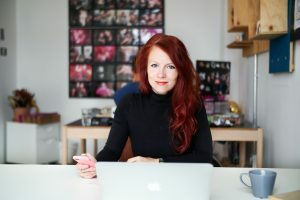 The coworking space model is evolving, from corporate spaces to coliving spaces, what direction do you see coworking going in from the perspective of a place like Blogfabrik? Did you already registered for Coworking Europe 2016 (Brussels, Nov 28-29-30) ?